Not a prototypical slasher like many of its contemporaries, nor a soft-handed attempt at a thriller, William Byron Hillman’s Double Exposure lies somewhere in between. A considerable mix of tones and styles, it attempts to nail down the tale of a photographer gone mad, or so we’re made to believe. When Adrian (Michael Callan) begins having nightmares about killing the models he’s taking pictures of, it isn’t long before his psychiatrist and the police begin to catch on. Meanwhile, Adrian attempts to escape his nightmares by courting a woman named Mindy (Joanna Pettet), but is her fate sealed or is there something else at work here beyond Adrian’s reckoning? A tough question, and one that Double Exposure attempts to answer. 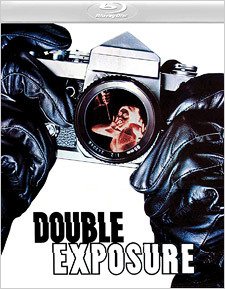 Lost and found in the shuffle of early 1980s grindhouse horror fodder, Double Exposure is a prime example of what American filmmakers didn’t often manage to capture: a giallo. Although the film isn’t billed as one, all of the traits and the way that the story plays out allows it to sit comfortably inside one. It’s also heads and tails above most movies of its ilk. Many of the performances and much of the dialogue feels natural. There’s real chemistry between Michael Callan and Joanna Pettet, and as their relationship blossoms on screen, one can’t help but get caught up in it. Interstitially, the murders/dreams continue to occur, some of which are quite suspenseful. Some might argue that the film’s tonal shifts are to its detriment, but the score manages to iron out some of those transitions, making it feel less choppy than without it. Even the style of the opening credits lets us know right away that this isn’t a film that’s going to be fully on the rails. Personally, I found it to be quite entertaining and engrossing, and I’m surprised that it isn’t held in slightly higher regard than it is. While it certainly doesn’t reinvent the wheel or add anything new, it’s better than most might give it credit for. Also including appearances by James Stacy, Cleavon Little, Pamela Hensely, Robert Tessier, and Sally Kirkland, Double Exposure is an effective thriller that feels a little more effortless than other films like it. Double Exposure is presented by Vinegar Syndrome via a 2K restoration from the original 35mm camera negative. The elements are in remarkably great shape, and the transfer itself is stupendous. Evenly-reproduced grain levels with a strong encode and a high level of fine detail are all on full display. Texturing, even in backgrounds, and especially in close-ups, is abundant. Color reproduction reveals some potent hues, particularly greens and blues, as well as very natural skin tones. Black levels are solid and deep with potent shadow detail, while brightness and contrast levels are thoroughly satisfying. Obviously, some of the film’s visuals are limited due to the way they were originally processed, but that aside, it’s quite a stable presentation with next to no major film artifacts leftover. The sole audio option is an English mono DTS-HD track. While not an overly deep presentation as far as bass activity is concerned, it’s a clean and clear experience with excellent dialogue reproduction, a biting score, and sound effects that carry some decent weight to them. There are also no noticeable dropouts or hiss-related issues. It’s a terrific presentation overall. Optional subtitles in English SDH are also included. For the supplemental materials, it’s almost exclusively all-new material, including an audio commentary with director William Byron Hillman; an isolated score audio track in mono Dolby Digital; Exposing Double Exposure – an interview with cinematographer R. Michael Stringer; Staying on Task – an interview with script supervisor Sally Stringer; the original theatrical trailer; a promotional still gallery; and a DVD copy of the movie. Unfortunately, this release doesn’t carry over the previous extras from Scorpion Releasing’s DVD, which included the Katarina’s Nightmare Theater experience; two audio commentaries – one with cinematographer R. Michael Stringer and script supervisor Sally Stringer, moderated by Katrina Leigh Waters, and the other with actor Michael Callan, moderated by Waters and Scott Spiegel; and an additional interview with Callan. Double Exposure is an interesting film, to say the least. Although it’s sometimes described as “dreck” elsewhere, I humbly disagree. It’s a fine film that doesn’t push the envelope much but is effective in what it’s trying to achieve. Unless you can manage to catch a revival screening of it paired up with The Eyes of Laura Mars (not a bad idea), Vinegar Syndrome’s presentation of it is excellent and should definitely be in your list of unsung movies to check out.